As every harpist knows, the harp is not the most portable of instruments. But sooner or later, the time will come for you and your harp to venture forth into the great unknown. Our two part article looks at the challenges of traveling with your harp and offers some suggestions to keep both you and your harp safe and sound on the road. The second part will look at a range of harps that have been specifically designed with portability in mind. This first part looks at optimising any harp you currently own for traveling. Your first consideration is to protect the harp. Make sure levers are disengaged and pedals are tucked away. For lever harps, get a waterproof case that covers the whole harp, rather than just a slipover cover. For pedal harps, use a heavy duty, waterproof slipover case along with a base cover to protect the pedals. Use additional foam or cloth to pad out the levers, bridge pins, discs and wings of extended soundboards if necessary. If your harp is going in the car, avoid leaning it on the bridge pins/levers/discs as these could get damaged. Lever harps can be leaned against a back seat, but be sure to secure it firmly. Pedal harps and large lever harps that are too heavy to be lifted into a car will benefit from a rear loading van or estate car. If you have one of these with the back seats folded down, lay a long, flat piece of wood on the floor of the vehicle. Lean the top end of the harp into the car and tuck a cushion underneath the top of the harp. You should then be able to slide the harp along the wood using the cushion, as if you were sliding a tray into an oven. Remember that extremes of temperature can damage harps, so be sure not to leave the harp in a hot or cold car. Public transport and air travel with a large harp can be fraught with difficulties, but can be possible with some planning ahead. Additional protection for the harp will be necessary, such as a heavy duty flight case, with detachable wheels. This flight case is designed to protect the Dusty Strings FH36 model lever harps, but with padding, other Dusty Strings harps (or lever harps by other makers) can be made to fit. The flight case is available either for purchase or for hire from Clive Morley Harps. A flight case for pedal harps is also available to hire from us. When flying with a harp, use a flight case, but check in advance any weight restrictions with your airline before you buy a ticket: these vary considerably between airlines, so its worth shopping around. Your harp will be checked in as excess baggage: again, the fee for this varies between airlines, so its worth checking in advance. Consider your onward travel: many buses will refuse to take large items such as a harp. Are you able to lift the harp onto a train, or negotiate stairs? If not, then you will need to hire a car – but again, check in advance that a suitable vehicle will be available on the day. 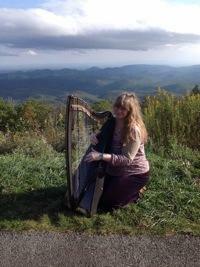 Morley Harps’ Paula Tait with her Infinity 36: Proving that you can even take a harp up a mountain. Once the harp is protected, your next consideration is to make the harp as easy to move as possible. If you have a small lever harp, such as a Ravenna 26, we recommend attaching rucksack straps to the case to allow you to carry the harp on your back and spread the load of the harp. If your lever harp is too large to carry on your back, you will need to use the handles to carry it by your side. If possible, hold the side handles with one hand and the front of the harp with the other. This will give your better control over the harp and also help to reduce the weight from one shoulder. Be extra careful going through doors and round corners. Large lever harps and pedal harps need a dedicated harp trolley. We sell two types: the standard harp trolley for occasional use and the harpist friendly Harpo Trolley, which is recommended for active harpists. It is is light; easy to steer; attaches easily and securely to the harp and copes well with various terrains, including gravel and climbing stairs. For transportation, or when not in use, it collapses into a compact size, with easily removable wheels. Moving a harp on a trolley is an art in itself. Some harpists walk backwards to keep an eye on their harp, but its better to walk forwards with one hand on the shoulder of the harp to steady it. That way you can see where you are going, but also feel if the harp starts to wobble. And watch those doorframes! Don’t be afraid to ask for help either. If someone offers to help, ask them to walk ahead of you to clear your route of people and other obstacles. Once you start taking the harp away from home, you might want to keep a harp emergency travel kit. This should include spare strings, along with scissors or pliers to change them. Some cautious harpists keep a spare tuning key in the car – and even a bicycle pump can come in handy for trolley punctures! Finally, if you are moving your harp out of the house be absolutely certain to get it insured with a specialist musical instrument policy, such as Newmoon Instrument Insurance or Allianz Musical Insurance. Double check that your insurance covers you for outside the house. Some policies cover you for an unattended vehicle and these are highly recommended.